Normally, an exuberant exclamation of my name prior to 10 a.m., even spiked with a hefty cup of coffee would not be met with a welcome reaction. However, this weekly greeting from Toan Tran had come to be one of my favorite interludes over the year I volunteered with a community in Palo Alto. I initially met Tran by chance. I was looking to volunteer with a local community called Magic, a group dedicated to applying ValueScience, a mindset of scientific methods and principles to promote the common good by increasing human satisfaction and reducing human suffering. 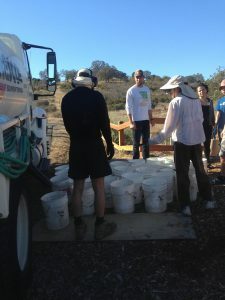 The group was active in community engagement and community service in the area around Stanford University, watering native trees and plants every Saturday morning. The first Saturday I volunteered, I was focused on not turning into a sunburnt mess while trying in vain to carry 30-pound buckets of water for three hours. It was hard work — much more difficult than I would have wanted for a Saturday morning — but it was satisfying to contribute something to drought resistance in the area’s agriculture. Magic volunteers, with buckets ready to be filled and carried to water the trees and plants. I returned a few Saturdays later, a little nervous. As I approached the group’s meeting point, I noticed a man with a ripped gray t-shirt, long cargo pants, and a floppy sunhat that covered his neck. Toan Tran left an impression. Although a woman supervised the volunteers, it seemed like Tran was in charge and did the majority of the work. This Saturday and for subsequent Saturdays that I volunteered with the group, I saw Tran arrive a half-hour before the start time to gather tools and set up the working groups at each of the watering locations— all while smiling from ear to ear. From that Saturday on, Tran and I became fast friends. He was impressed by my determination to volunteer every week, and I was impressed by his positive demeanor through every activity we did. Much like other members of the group, Tran had a degree from Stanford — a master’s in electrical engineering. He had moved from Vietnam to the United States in 2010 specifically for its program, and continued to live in in the Bay Area after he finished his studies, in order to stay on with Magic. From his initial move to the Magic community’s home in Palo Alto to when I initially visited, the organization’s home base had expanded from one property to three adjoining properties, with the residents fluctuating over time, but typically adding up to between 23 and 27 persons. The group lived together in a shared space, had nightly community dinners, required volunteer work, and organized group activities like bicycling to the coast and hiking. I began to attend the group’s community dinners in the summer, and would often bring a Greek yogurt fruit tart for dessert. Tran called it “cake,” and would ask me if I brought the “cake” for after dinner. I’d say yes, and tell him he had first dibs. After a few months, Tran began to ask for my help and guidance with his own projects. He was hoping to utilize his computer and tech skills in a new endeavor. He asked me if I thought his new business plan — a platform to bring high quality electronics from Silicon Valley to people in other parts of the world — could work. I encouraged him to try it out. Now, months later, he is able to operate his start-up, Silicon Valley Computer, alongside his responsibilities at the community. Through Tran’s guidance, I was able to evaluate my own beliefs in ValueScience and community living, and became more well-rounded. I don’t know what person I’d be now if not for the Magic community, primarily Tran, and their love and friendship over the last year. I no longer live near Stanford, and have missed the weekly volunteering at the Dish. Even months after seeing them, I can still feel the warmth of Tran’s simple, penetrating greeting. I would trade my coffee fix anytime for the comforting embrace of his jovial greeting.